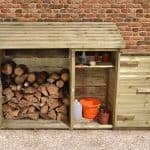 Garden Storage Boxes - Top 20 Garden Storage Boxes? 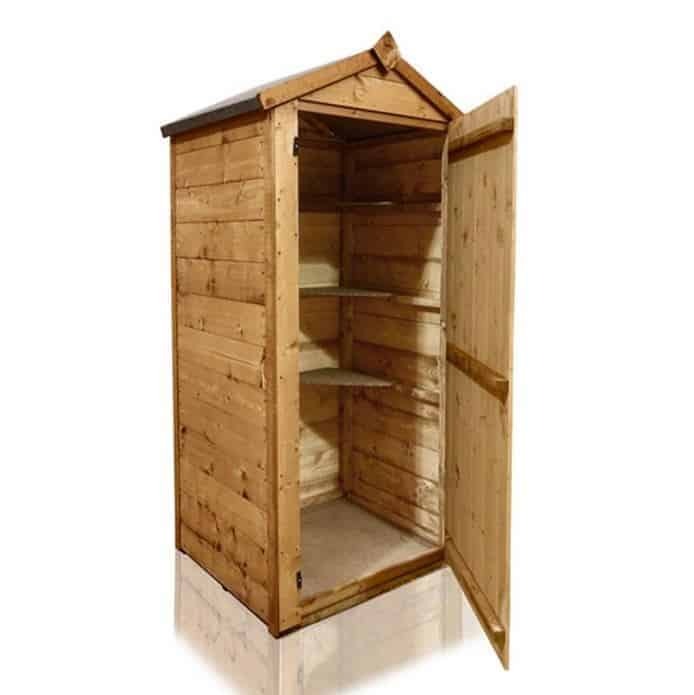 At WhatShed we’re renowned for providing independent, in depth, and informative reviews of a whole range of garden buildings, from wooden garden sheds to metal workshops, but we’ve also review a wide range of garden storage solutions. In fact, we’ve looked at storage boxes sold by the UK’s top 10 shed and accessory retailers, and between them they account for 95% of all such purchases made online today. That’s why you can be confident that the 20 garden storage boxes that make it into our league table really do have something special to offer the consumer. 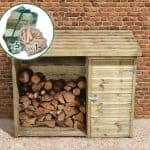 There’s a large selection of garden storage boxes to choose from today, made out of traditional timber as well as contemporary options such as polycarbonate and galvanised metal, and there’s a wide variety of prices attached to them as well. When choosing the very best we’ve taken into consideration a number of factors, including price and value for money, as well as storage capacity, durability, and aesthetic appeal. 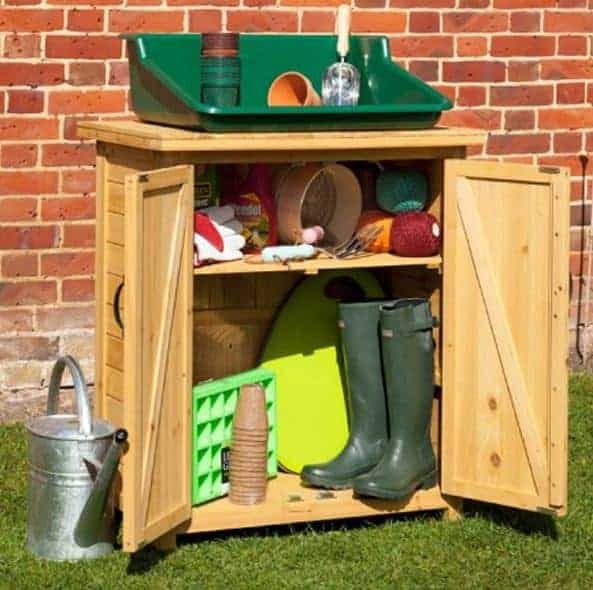 In this way we’ve been able to include high quality storage boxes to suit all budgets, so let’s enter the WhatShed list of the top 20 garden storage boxes available online in the UK today. 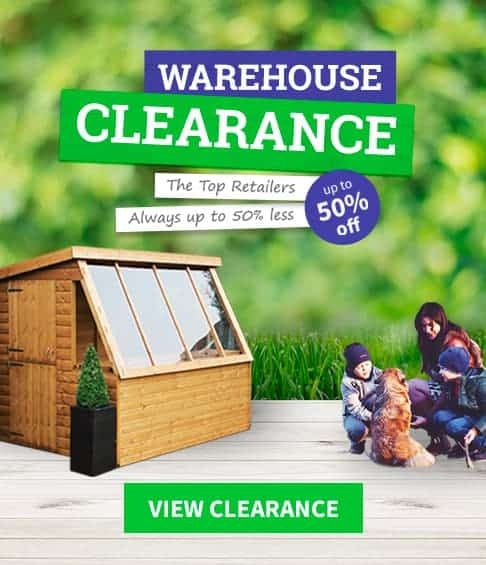 Well done to the Store-Plus 4′ X 3′ shiplap storage box which, thanks to its long warranty, great value and traditional good looks, gains the top position in our list of the top 20 garden storage boxes that can be bought online today. There are storage boxes to suit everybody on this list, and yet they all have properties that lift them above the ordinary. Whether you’re interested in garden stores, log cabins, or PVC sheds, WhatShed will continue to bring you the in depth reviews that help you find the perfect building or accessory for your garden. As mentioned above, garden storage boxes are now available in a variety of substrates, each with their own unique benefits and each of which you’ll find represented in our top 20, but when it comes to traditional good looks that blend perfectly into a garden setting this wooden storage box from Store-Plus is unbeatable. With a large storage capacity allied to a price of just under a hundred pounds as well, this has a lot to recommend it. The storage box itself has a width of 1.26m and a depth of 0.86m, and it also has a peak height of 0.94m. This is at the back of the box as it has a pitched front which carries water away. It’s also been dip treated with preservative which gives it a good initial protection against the elements, and has pressure treated floor joists, and it’s for these reasons that it comes with a 15 year warranty against rot which is as long as any that we find on a timber storage facility. The lid itself lifts up and can be locked into position by a strut and a front panel can also be lifted out, giving easy access to the interior. With so much to offer, this strong and capacious model deserves to be at the top of our 20 best garden storage boxes. Metal storage boxes have two big advantages over their timber counterparts: they’re extremely tough, durable, and impact resistant, and secondly they are virtually maintenance free. 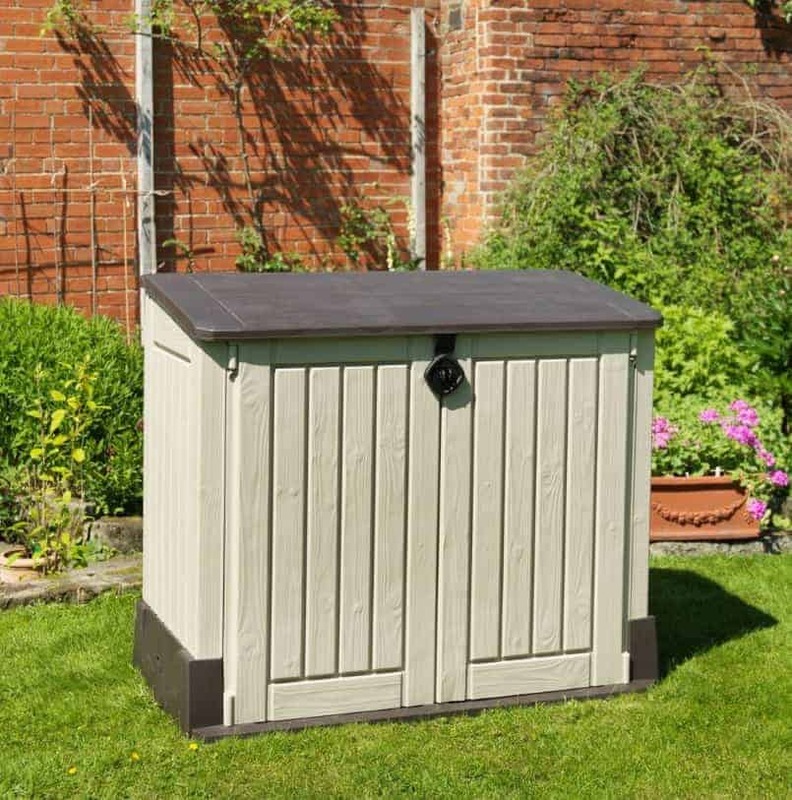 We know that some people don’t like to have something which looks metallic and artificial in their garden however, but this is a storage box that belies its metal origins and blends in seamlessly with a garden background. It’s this, combined with its generous storage capacity compared to its price, that gains it the number two position in our list of the very best garden storage boxes. We were very impressed with the dark green colour scheme applied to the metal, with a flat white lid that means it can be used as a double garden seat. The base width of 1.28m, base depth of 0.68, and height of 0.73m means that you can fit a lot of equipment inside, and once in there it will receive excellent weather protection. That’s because hot dipped galvanised steel has been used for the cladding, and it’s very effective at keeping rainwater out as well as bringing with it a 15 year warranty against rust perforations. If you’ve never experienced the benefits of steel garden storage boxes, this is an ideal place to start at a price of a little more than a hundred pounds. Taking third spot, this is the highest placed of the plastic garden storage boxes to feature in our top 20 league table. Although made of tough and reliable plastic, it has a wooden effect finish applied to it. Even so, with a beige colour scheme for the walls of the storage box with a dark brown lid or detailing, it will never have the good looks of some of the timber varieties found in our list. Nevertheless it is a very practical storage solution, and very large as well which earns it this elevated position. This is one of the larger garden storage boxes on our list, as we were careful to consider only the storage boxes that are designed to meet the needs of a standard sized domestic garden. It has base dimensions of 1.30 X 0.74m with a height of 1.10m, so there’s enough room to fit all your garden tools and supplies in, and there’s even an integral shelf. We were very impressed that a storage capacity of a huge 845 litres can be bought for such a large price, and of course being made of plastic there are no worries about rotting or rust. Whilst it only comes with a two year warranty, therefore, we wouldn’t be surprised to see it last much longer. This then is one of the best value storage boxes on our list, and very tough and durable too. When reviewing wooden garden sheds the choice of cladding can make a big difference, with tongue and groove cladding being significantly tougher than overlap cladding, but when it comes to wooden storage boxes the difference is less pronounced. That’s because the box has a lower profile and therefore has greater stability, and is less likely to be affected by severe weather. That’s why, despite having overlap cladding that’s 8mm thick, this traditionally styled wooden storage box deserves to be ranked so highly in recognition of all it has to offer. It’s another well sized storage box, with a width of 1.19m, a depth of 0.77m, and a peak height of 0.93m. The sloping lid, which like the overlap cladding itself does a good job of carrying rainwater away, can be propped open when the storage box is in use, and there’s easily enough room to store a couple of garden chairs, some bags of compost, and a selection of tools or toys. There are wooden floor joists at the bottom which by raising the floor above the surface help to reduce the risk of ground moisture that can otherwise cause wet rot. 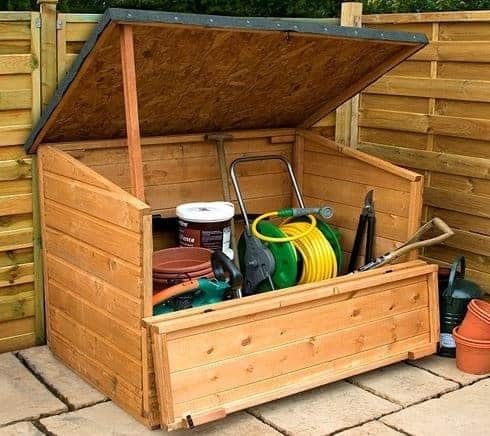 We were pleased to see a 10 year warranty supplied as standard, making this one of the most reliable and long lasting wooden garden storage boxes. Rowlinson are noted for their practical and well built sheds, so we were pleased to see that they brought the same reliability and attention to detail to their garden storage boxes. It has a very valuable storage capacity, thanks to a width of 1.90m and a depth of 0.88m along with a height of 1.03, and there’s a slight pitch to the roof which carries water away. One thing that stands out about this storage box, and which helped it into our top five, is that it’s incredibly easy to store and retrieve items. Not only does the lid lift up, where it can then be propped open with two strong struts, it also features a double sliding door at the front. The sliding itself is fitted internally, so the doors are protected against accidental impact. 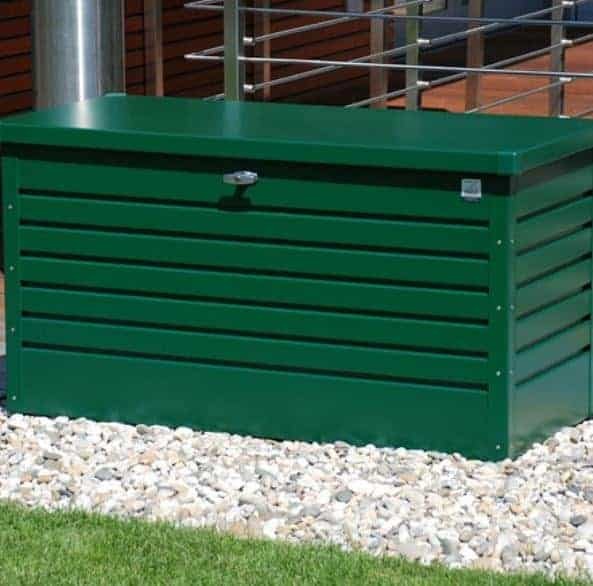 The storage box is very tough as it’s made from metal, but once more we found it pleasing to the eye thanks to its adoption of a green colour scheme with contrasting white roof and doors. It’s worth noting that no floor is included, so you’ll need a level area of concrete or patio to site it upon, but it’s reliably stable and sturdy once assembled. If you like garden storage boxes that put the emphasis on ease of use and retrieval, this makes an ideal and good value choice. This has the design of a tall yet compact wooden garden shed, and yet it’s designed with storage in mind and so qualifies for our list of the best garden storage boxes. 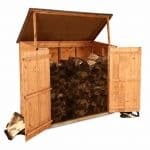 As such, it has a unique appearance, and yet it’s one that we found very attractive, and so it will make a good alternative for those who need a well sized storage facility for their garden but don’t want a product that simply sits there like a box or chest. It has a compact footprint of 0.93 X 0.70m, which means that it won’t take up too much space in your garden. It can hold a lot more than you might think, however, thanks to its peak height of 1.59m. As well as the storage room on the solid sheet material floor, there are three corner shelves integrated into the unit, which we found a neat and useful touch. The apex roof is felt covered to increase its durability, and the body of the store is made from tongue and groove cladding. 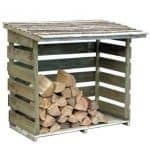 Overall this is an original and good looking addition to our league table of garden storage boxes, but it will need regular preservative treatments from the customer and this stops it climbing higher up our top 20 list. 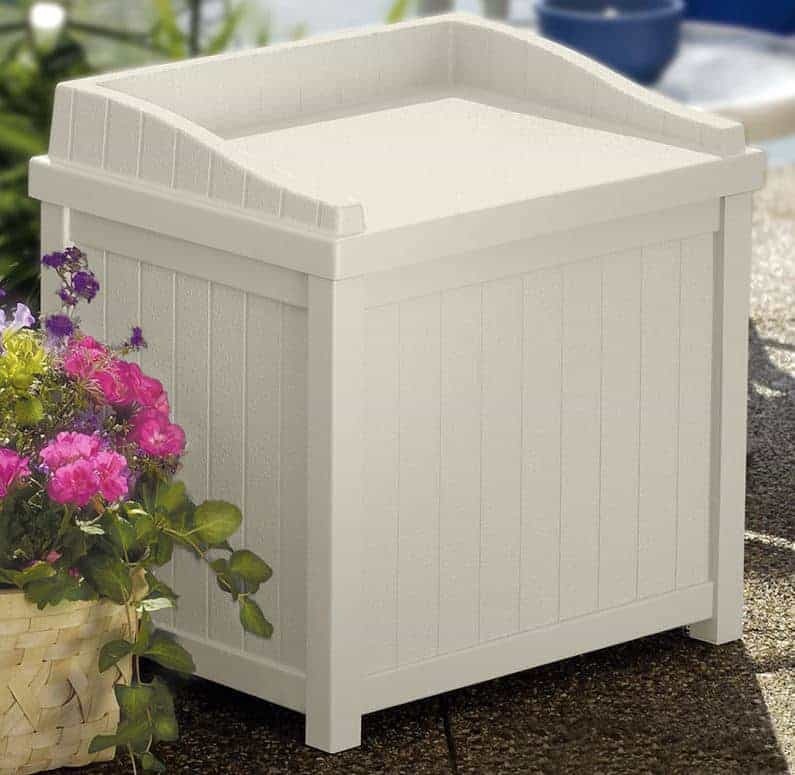 Being made of powder coated steel covered by polyethylene plastic, this is one of the most durable garden storage boxes on our list, and with its high storage capacity as well it earns its position within the top ten. We liked the contemporary styling, with clean lines accompanied by a white finish. 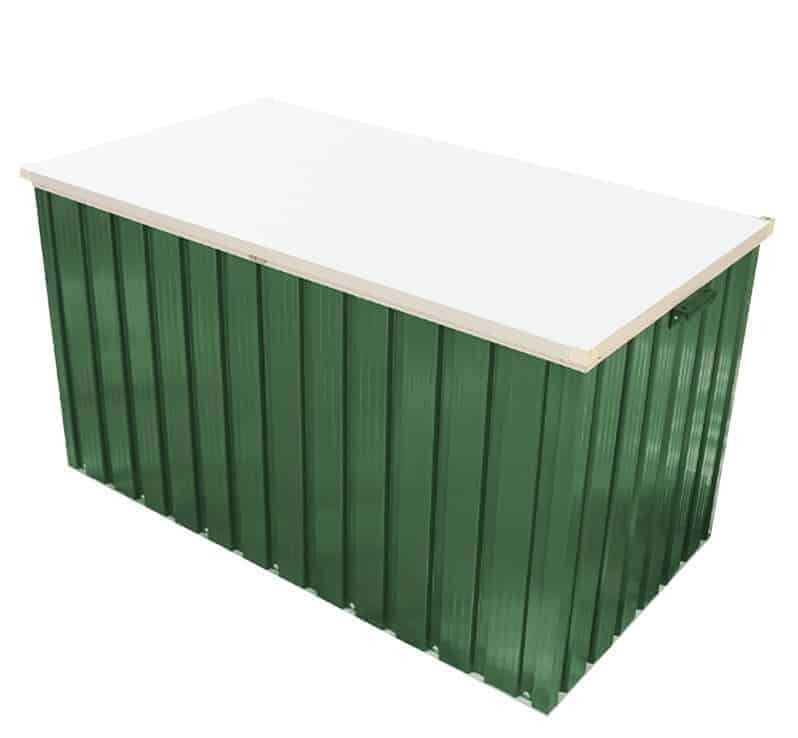 This will fit in perfectly with property that has a white PVC shed, roofline, or conservatory, and because the polyethylene is UV stable you won’t have to worry about the colour fading over the years. There are also, of course, no worries about the appearance of rust or rot, and this is backed up by the manufacturer’s 10 year warranty. We do feel this could have been even longer given the substrate used, but it still gives added peace of mind. A near 130 gallon capacity is created by a width of 1.52m, a depth of 0.61m and a height of 0.67m. We liked the rubber seal around the lid as well, ensuring that the contents inside are kept dry whatever the weather outside. The height also creates a comfortable position to sit down at, and we found that this makes a very stylish double garden seat for two. This combination of versatility with an eye catching modern design places this among our favourite garden storage boxes available to buy online today. Keter make a wide range of garden storage boxes, encompassing many styles, materials, and price ranges, but this model particularly caught our eye. 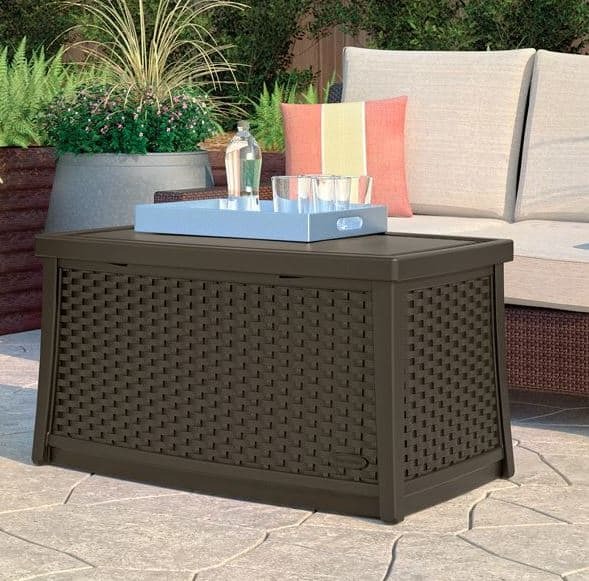 It’s made solely of plastic, with all the benefits of durability that brings at the same time as being maintenance free, but it has a uniquely attractive look by taking on a woven rattan appearance. It’s available in a brown colour which can look even more authentic, but we liked the dark grey colouration of the anthracite option. It’s not only the stylish design that carries this storage solution into our list of the 20 best garden storage boxes, nor the fact that it also makes a sturdy and reliable garden seat, but also because it’s very good value and easy to use. It has an automatic opening facility which is especially useful if you have an armful of items that you’re about to deposit inside the garden store, and it was good to see that the lid is padlockable, even if a padlock isn’t included as standard. 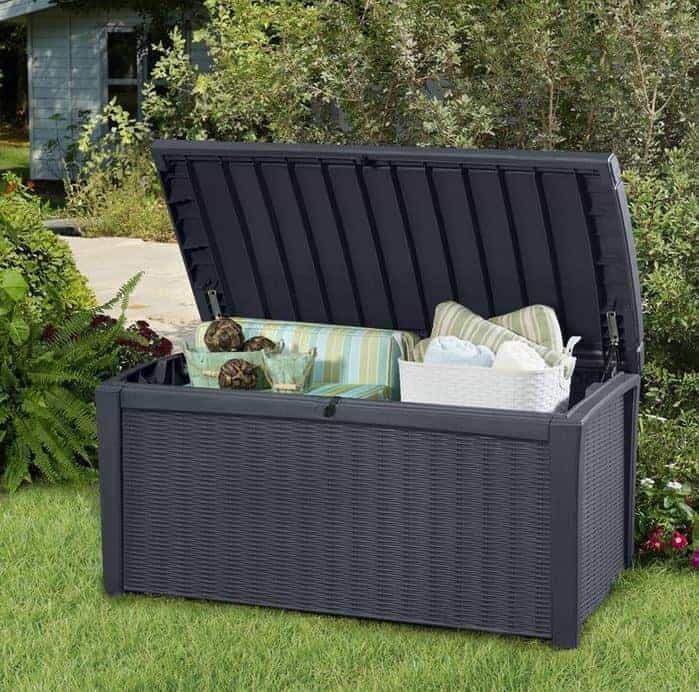 It’s base size of 1.30 X 0.70m puts it comfortably in the mid range of the storage boxes on our list, but it can still seat two people and it will hold a large amount of gardening tools and equipment. People are increasingly concerned about their carbon footprint, so we were pleased to see that this particular wooden storage box was made from a sustainable source, as certified by the FSC. 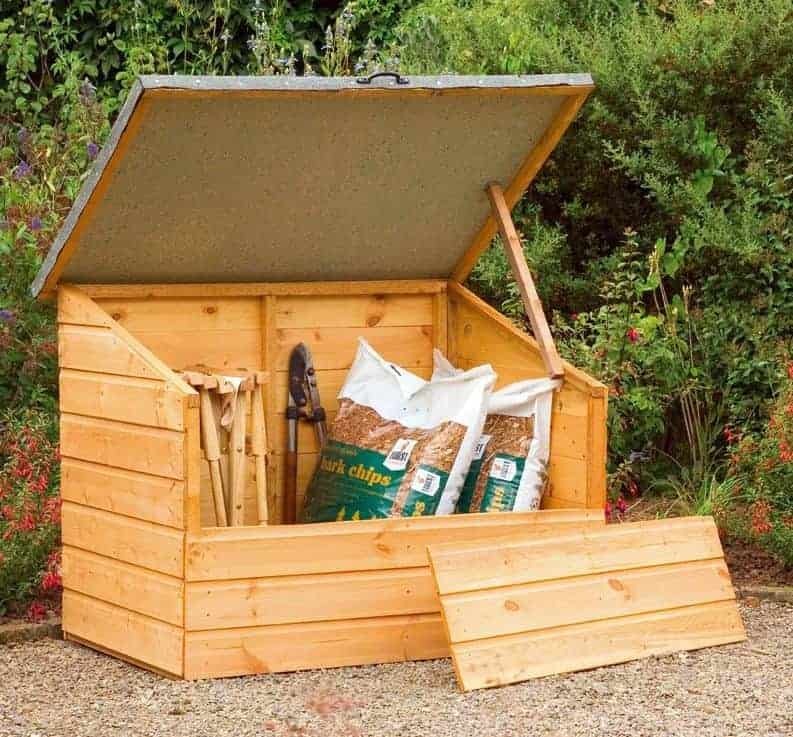 It’s one of the most compact timber garden storage boxes to make our top 20 list, yet it’s also very stylish and so will not only prove a very useful facility to store tools, seeds, and more inside, it can also become an attractive garden feature in its own right. The base width is 0.75m and the base depth is 0.55m, whilst the height is 0.85m. The front features fully braced double hinged doors, so when they are opened up it’s easy to gain full access to every corner of the interior. The lid lifts up as well, so you can store and retrieve an item in seconds. What we particularly liked about the interior is that it features a strong wooden shelf, which means that you can make the most of all the vertical storage space available. We were also glad to see that the floor is lifted above ground level, and therefore free from the threat of ground moisture, and that the timbers are protected by a 10 year guarantee. If you’re looking for compact and unobtrusive garden storage boxes, this is certainly worth a look. Even those with small gardens can benefit from garden storage boxes, which is why this compact, highly affordable and yet attractive garden storage seat rounds out the first ten in our top twenty list. It has a width of 0.57m and a depth of 0.44m, along with a height of 0.57m, and we can imagine it being used by people who still love their gardening and yet find it hard to bend down to carry out weeding or planting. 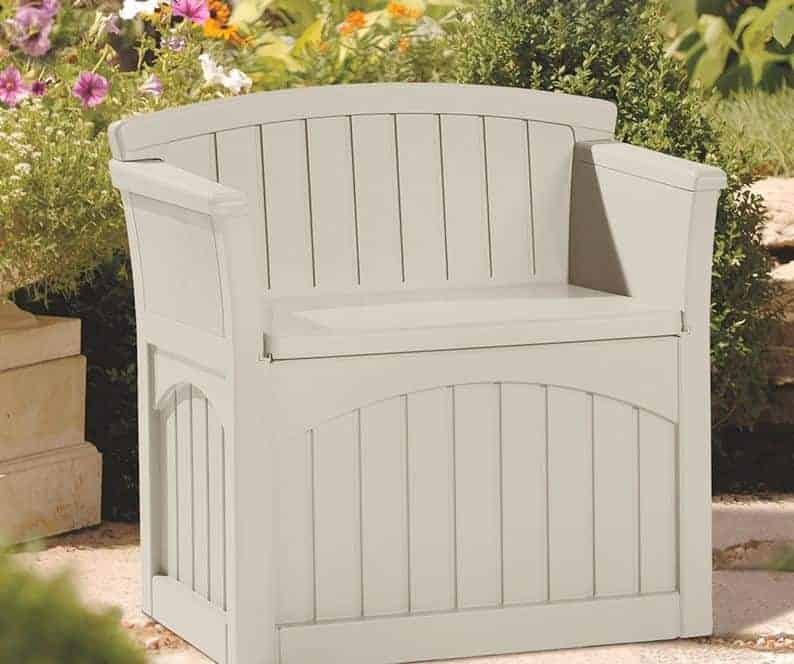 Simply use this garden seat for added comfort during the operation, and you can be carrying the tools needed for the job around with you at the same time. This dual purpose provides added value to a product that’s also very well built. Moulded plastic is used for the box, but we liked the off white taupe finish used on it, as well as the side and back support above the base of the seat itself. This takes away the plastic appearance, and makes the product look stylish and more expensive than it actually is. Only a basic one year warranty is supplied, but as the material is naturally rot and rust free this isn’t something to be too concerned about. We’ve reviewed lots of garden storage boxes designed for the smaller garden, but at a price of less than fifty pounds this is among the very best. Biohort are a company that are transforming the world of garden storage boxes, and when we review them we are always struck by their stunning contemporary styling. That’s certainly the case here, and whilst the leisure time box is also available in other colours, we particularly liked the dark green model. Even in a garden dominated environment dominated by shades of green this can look a little conspicuous, but we feel it stands out for all the right reasons. Biohort garden storage boxes are made from polyester coated hot dipped galvanised steel, and at 0.55mm thick the steel is much thicker than we find on the other metal storage boxes we review. This brings a lot of benefits, as shown by the provision of a 20 year warranty, which is longer than any other in our top 20 except for Biohort’s other entry. There are lots of things we like about this box, including the fitting of a key operated cylinder lock as standard; there’s even a spare key included. There’s also built in, yet invisible, ventilation and a gas operated easy opening system. Only its relatively high price for a compact storage box prevents it being placed much higher, so if you’re looking for a small store and this falls within your budget then this can be an ideal purchase. This is very much a mid sized garden storage box, but for the amount of storage space it provides it represents very good value for money. The first thing we noticed is that it’s quite wide, at 1.28m which combines with an external depth of 0.65m, so it’s possible to store even relatively long garden implements inside such as a rake, hoe, or strimmer. It also has a height of 0.61m, which is just perfect to sit upon and it can seat two people comfortably. We liked the way that the lid curves outward slightly, as whilst this has no effect upon its comfort as a seat, it helps to carry rain away rather than allowing it to sit upon the surface. We know that some people find the appearance of plastic garden storage boxes less than appealing, and yet we found that this particular example more satisfying on the eye thanks to its slate grey colouring. One feature that we really liked is the hydraulic lift mechanism on the lid, which means that it’s easy to open even if you’re hands are full. There are larger and more attractive storage solutions available for the garden of course, but at this price we feel it deserves its place within our top 20 storage box league table. 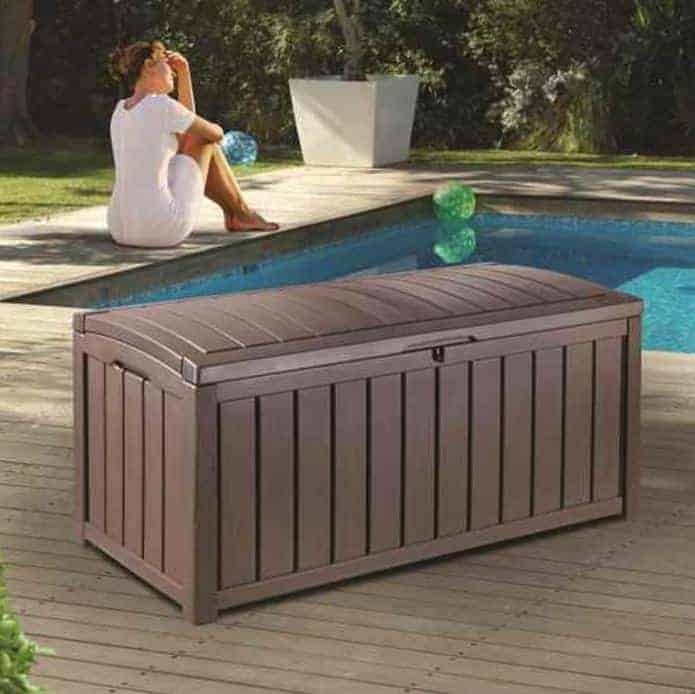 This offers considerably more storage space than Suncast’s single deck storage seat, and yet in doing so it loses a little of its charm as well as costing more which is the reason that it features lower down in our list of the 20 best garden storage boxes that are available to buy online today. Nevertheless, it does have a look of its very own and while we can imagine some people finding it a little too plastic looking we found it quite eye catching. It apes the style of a traditional garden bench, with a high back rising up from a double seat, but of course underneath it all is a highly useful storage space. Its looks will never pass as a timber garden bench, but at least it will add a unique feature to your garden. It’s still on the small side of the garden storage boxes we review, with a base size of 0.78 X 0.52m, but that makes it easy to assemble and to transport, and there’s still enough space for a good selection of garden tools. Being made of a white coloured plastic it’s also very resilient, so the 5 year warranty supplied by the manufacturer could have been much longer. 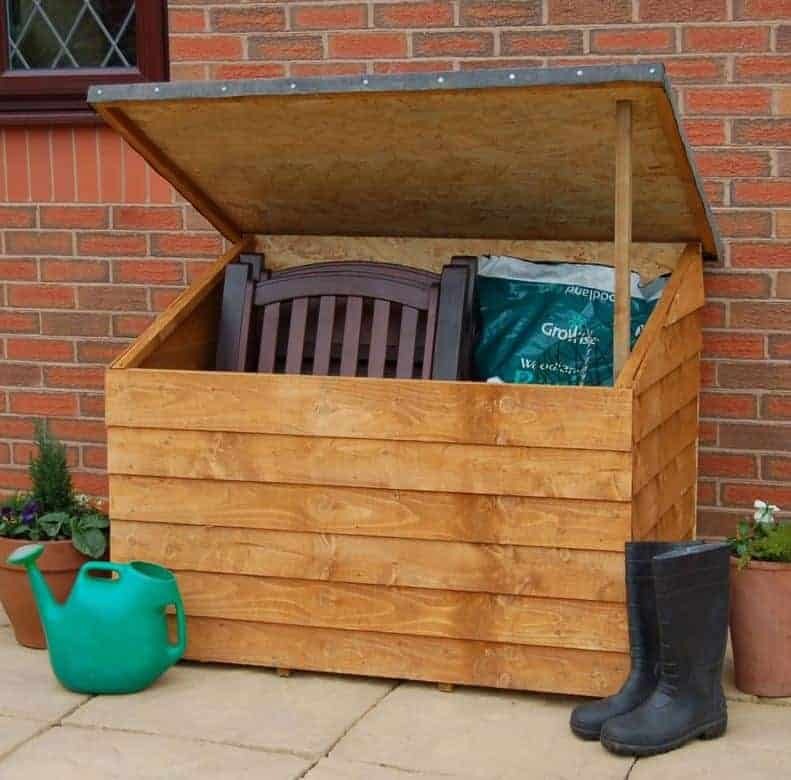 If you’ve like the idea of garden storage boxes that can double as weather proof garden benches then this could be the product for you. If you love the traditional timber shed in your garden, then you’re probably going to want something that’s just as traditional and good looking when it comes to garden storage boxes. That’s where the Bernard wooden storage chest scores very highly. The body is made up of shiplap cladding, and although it isn’t as thick as some that we’ve reviewed, measuring 8mm, it is still very resistant to weathering and knocks. Being made purely of wood you will need to treat it with wood preserver on an annual basis, but at this size that shouldn’t be too time consuming a task. The interlocking cladding is very effective at stopping water penetration, which is particularly useful if you’re planning on storing objects such as bags of soil inside. Whilst this isn’t the largest storage chest that we’ve seen, with base dimensions of 1.22 X 0.77m and with a height of 0.92m, it benefits from very easy access. 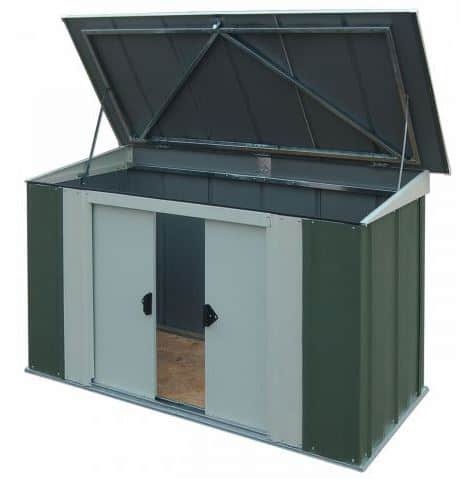 The solid sheet roof lifts up and can then be kept open by a side positioned strut, whilst the upper portion of the front face is hinged and can be dropped down. This is particularly useful when dropping heavy items, such as the aforementioned bags of soil inside, and is another reason that this makes our list of the top 20 garden storage boxes. Whether we’re reviewing sheds, summer houses, or garden storage boxes we always like to see attractive designs that are completely unique, and that’s one reason why this Keter wooden storage box makes it into our top 20 league table. 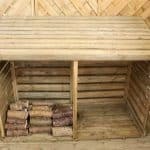 Despite its name it isn’t made of wood at all, but is instead manufactured from tough and weather proof polypropylene. It does, however, have a dark wood effect, and from a distance it could indeed be constructed of timber. The thing that differentiates this from the other garden storage boxes we’ve reviewed is that it’s round rather than roughly square or rectangular, so it looks a little like a short barrel. 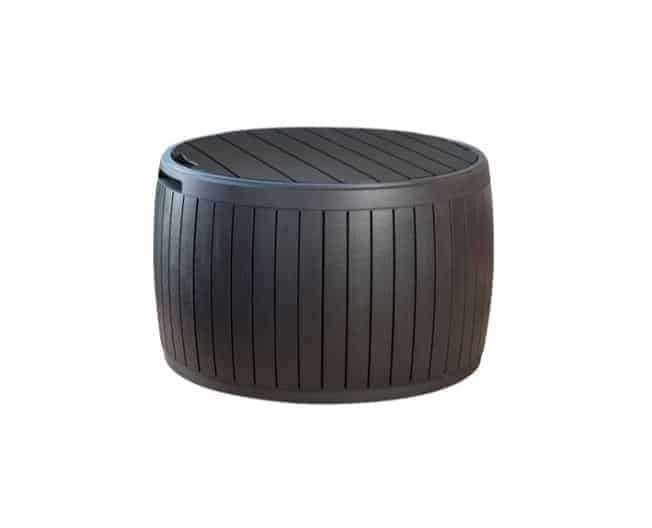 It has a diameter of 0.67m with a height of 0.44m, so although it can also be used as an attractive garden seat it’s also one of the smaller storage boxes we’ve reviewed. One advantage of this, however, is that it’s very easy to manoeuvre even when fully loaded, and it comes with integrated rollers underneath for this purpose. Being made of plastic it’s very tough and requires no maintenance, which combined with its original looks is enough to propel it into the lower reaches of our top 20 garden storage boxes, especially as it also comes with a very affordable price tag attached. This is the second Biohort product to make this league table of the very best garden storage boxes available online in the UK today, and once again it’s only its price for a relatively small storage area that prevents it from being placed within our top ten. The manufacturer’s have used cutting edge technology to create a storage box that is very tough and durable, and it also has a highly contemporary styling with a pure white colour scheme that won’t look out of place in the gardens of the most modern of homes. Certainly it’s a look that we found both original and attractive. We’ve reviewed many metal storage boxes but none, other than those made by Biohort, have galvanised steel cladding to the same thickness. This is very noticeable when the box is assembled, and so if you want garden storage boxes that will last and last this is the manufacturer to turn to, as the 20 year warranty included with this storage box shows. 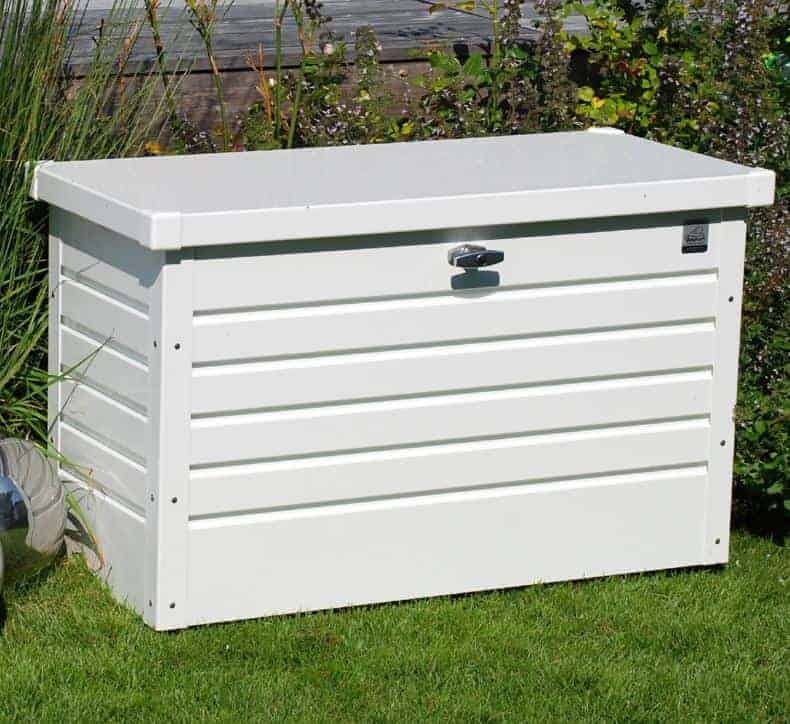 Its price can’t bear comparison with other garden storage boxes of a similar size, which in this case is a base of 0.93 X 0.35m and a height of 0.61m, whether made of metal, timber, or plastic, but sometimes you have to pay a little extra to obtain the very highest quality. If quality is your prime consideration when looking for a compact garden storage box then this should certainly be on your short list. When compiling our league tables, we like to include something to fit all budgets, but of course they still have to be of a high standard and provide a useful addition to a customer’s garden. We feel that this bargain priced plastic storage box does just that, and at such a low price it’s available to absolutely anyone. 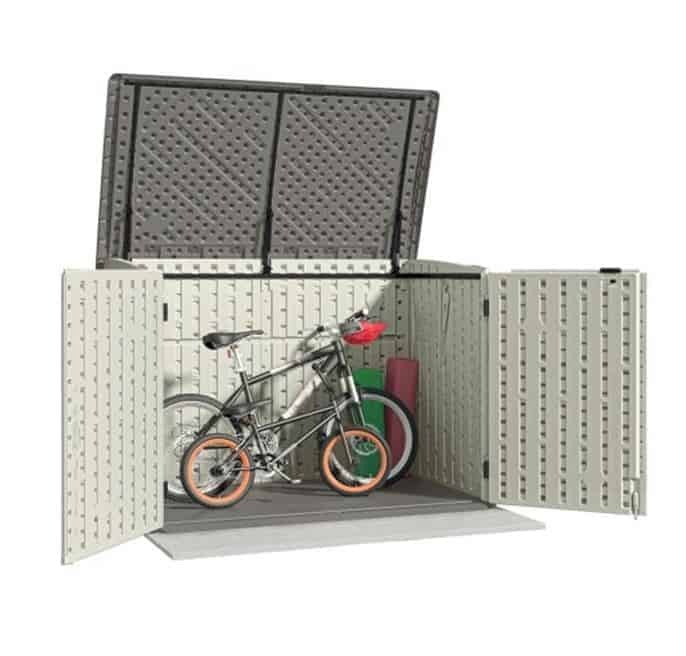 This means that even people working to a very tight budget can now have a secure and weather proof place to keep their tools, or it could even be used as a place to keep the outdoor toys of your children or grandchildren. One thing that pleasantly surprised us for such a low cost plastic storage box, is that it looks quite attractive thanks to a wood grain effect that’s been applied to the moulded plastic. It’s larger than you might expect as well, with its base dimensions of 1.17 X 0.45m and a height of 0.58m creating a storage capacity of around 270 litres. We were pleased to find that it has a built in hasp, so that a padlock bought separately can easily be fitted, and that it has fitted wheels for transport purposes. This then may not be the most sophisticated example, but it is possibly the best value of the garden storage boxes we’ve reviewed. Dining al fresco, whether breakfast or supper, is becoming increasingly popular which is why patio and garden furniture is in such demand. 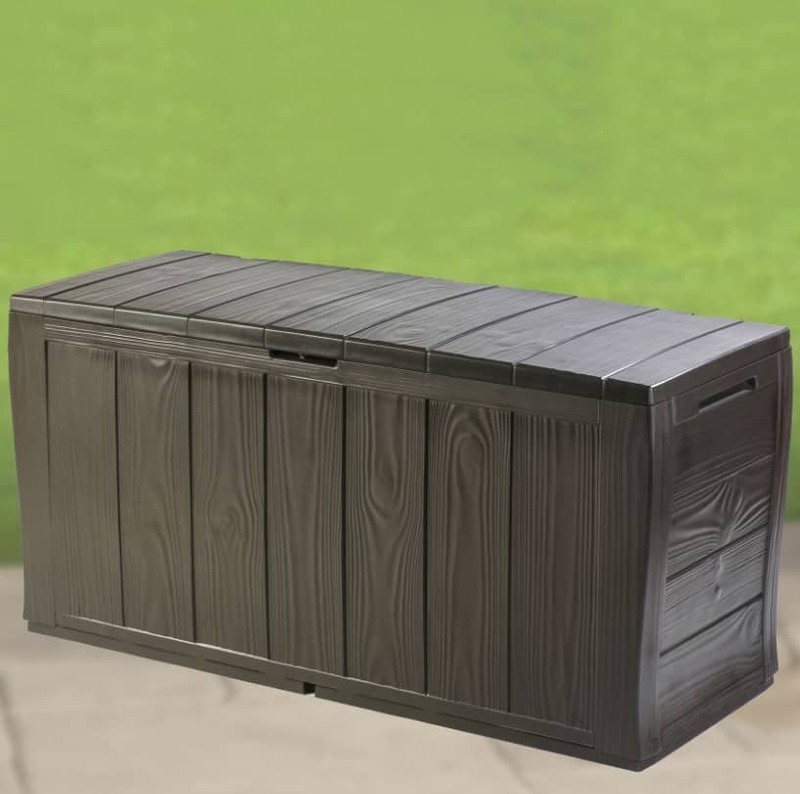 This unique item from Suncast combines the practicality of outdoor furniture with the advantages of storage boxes, and in doing so makes it into the WhatShed list to the best garden storage boxes. It’s not the prettiest storage box you’ll find in our list, as its plastic nature is very noticeable, yet it does address this by adopting a wicker design that elevates it above the storage boxes bearing a plain plastic façade. This isn’t one of the larger garden storage boxes that we’ve reviewed, as its width of 0.86m and depth of 0.51 create an internal storage capacity of 114 litres, but this does allow it to store a more than moderate amount of tools or gardening materials as well as doubling up as its other purpose. The smooth flat resin top is ideal for placing cups and saucers on, and its height of 0.46m is ideal fir coffee table purposes. When clear of drinks it’s this table surface that lifts up to allow access to the storage area. 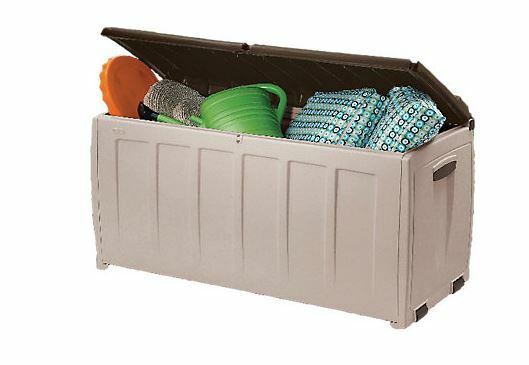 With the toughness of plastic and a five year warranty as well, this earns its place among the best garden storage boxes. One of the advantages of smaller garden storage boxes such as this one, especially those that are made of plastic and are therefore lightweight as well, is that they can be used both indoors and outdoors. It’s this intrinsic versatility as well as its outstanding value for money that lifts this model into the WhatShed list of the 20 best garden storage boxes. It may be billed as a cushion box, and indeed it’s ideal to keep cushions, bedding, and linen in, but its waterproof nature makes it perfect for outdoor use all year round. It’s made of polypropylene, which is very tough, doesn’t fade in the sun, and won’t rot or rust. Put simply, it’s a garden storage box that you can buy and then not have to worry about again. For the very low price it’s surprisingly roomy inside, with a 340 litre storage capacity thanks chiefly to its width of 1.25m. It can also be used as a two person seat, and its this flexibility from such a budget priced product that we particularly welcomed. It won’t win any prizes for its good looks, but if you don’t mind a beige and brown colour scheme, and practicality and price are the factors that you look for most of all, then this is a storage box worthy of consideration. As we finish our run down of the 20 best garden storage boxes, we move from one of the cheapest storage boxes to the most expensive on the list, and also the largest. When compiling this guide we wanted to include a diverse range of products that demonstrated the requisite quality, but at the same time ensuring that they were storage boxes rather than storage sheds. Thanks to its design, where both the double doors and roof open outwards to allow total access to the interior yet close up to make a box shape, this meets our garden storage box criteria. The price tag of nearly five hundred pounds is the only factor that prevented this storage solution rising up the rankings, but if you want a large storage space and have a budget that matches then this could be just what you’re looking for. It’s one of the toughest garden storage boxes we’ve seen, being made of white plastic resin upon a steel frame, and this also makes it very weather resistant although it doesn’t come with a log extended warranty as we would have liked. It has a width of 1.55m and a depth of 1.16m, and a very generous height of 1.34m which means that you could store bicycles inside as well as lawn mowers and garden tools. We also liked the integrated ramp to facilitate objects that need to be wheeled inside.